Mozambique Kiōng-hô-kok tiàm-tī lâm Hui-chiu ("lâm-hui") tang-hōaⁿ. Keh-piah ū Tanzania, Malawi, Zambia, Zimbabwe, Lâm-hui-kok, Swaziland. 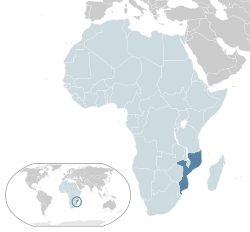 Mozambique Hái-tō koh kòe sī Madagascar. ↑ "The World Factbook – Field Listing – Population – CIA". Central Intelligence Agency. 7 March 2015 khòaⁿ--ê. ↑ Neto, Octávio Amorim; Lobo, Marina Costa (2010). "Between Constitutional Diffusion and Local Politics: Semi-Presidentialism in Portuguese-Speaking Countries". Social Science Research Network. 20 August 2016 khòaⁿ--ê. ↑ Shugart, Matthew Søberg (September 2005). "Semi-Presidential Systems: Dual Executive and Mixed Authority Patterns" (PDF). Graduate School of International Relations and Pacific Studies. United States: University of California, San Diego. goân-loē-iông (PDF) tī 19 August 2008 hőng khó͘-pih. 20 August 2016 khòaⁿ--ê. ↑ Shugart, Matthew Søberg (December 2005). "Semi-Presidential Systems: Dual Executive And Mixed Authority Patterns" (PDF). Palgrave Macmillan. Palgrave Macmillan Journals. 3 (3): 323–351. doi:10.1057/palgrave.fp.8200087. goân-loē-iông (PDF) tī 2016-03-04 hőng khó͘-pih. Of the contemporary cases, only four provide the assembly majority an unrestricted right to vote no confidence, and of these, only two allow the president unrestricted authority to appoint the prime minister. These two, Mozambique and Namibia, as well as the Weimar Republic, thus resemble most closely the structure of authority depicted in the right panel of Figure 3, whereby the dual accountability of the cabinet to both the president and the assembly is maximized. ↑ "Moçambique tem novo governo". VOA. 17 January 2015. ↑ 6.0 6.1 6.2 6.3 "Mozambique". International Monetary Fund. 17 April 2013 khòaⁿ--ê.
Chit ia̍h siāng bóe tī 2018-nî 7-goe̍h 27-ji̍t (Pài-gō͘), 16:58 ū pian-chi̍p--koè.